it's official: this blog has gone all chacarron, all the time. Mijn collega Dave kwam terug van Curaçao met een zeer geestig aanstekelijk liedje, chacaron. Na twee keer draaien stonden de lijnen roodgloeiend. Ik dacht voor de grap een Nederlandse versie te maken, maar het loopt helemaal uit de hand. Nu wil iedereen dat nummer hebben. not surprising, there's a ringtone version of that one, too. my googlings have also uncovered yet another cover of the irrepressible mumblejam. this time by a group called bacacha, from god-knows-where (google is little help). fwiw, that version mainly seems to be sold in germany. but none of these "other" versions seem to match the elan of "the original". i've also turned up some further leads in my attempts to pin down the original artist. a number of message boards pointed me back to el chombo via a group called comando tiburon (a fitting name for folk who like to "shark" around), who at least appear to be responsible for the "coolie dance" version (which i've still yet to hear). but, then, their site doesn't mention "chacarron," which would seem a strange omission. and speaking of chaca-riggity-ron (check the chorus), of late i've been pursuing yet another interesting genealogical snarl in the roots-rap-reggae complex. that riggity figure is no mere mumbletrope. no, it has a much richer history than simply being the invention of some psuedo-borracho rapero. this very manner of spinning off rhythmic syllables has been, to my ears, one of reggae's most enduring contributions to the global hip-hop lexicon (and one of the easier ways of trying to trace such transmissions). think, for instance, of the classic das efx opener: "riggity-rowl, gibbity gadzooks, here i go, so, fliggity-flame on, g-geronimo, yo!" not insignificantly, when discussing hip-hop in various contexts outside the US, observers often describe what they call "raggamuffin" elements - by which, i take it, they usually mean this sort of vocalizing - as an important marker of local style (whether in australia, italy, etc.). the frequent presence of this reggae-identified practice seems to support the notion that rap and reggae have largely traveled together outside their central sites of production and are often conflated by audiences and practitioners alike (though they are also clearly differentiated from each other within certain purist, fetishistic circles - not to mention among us regulah joes). i suspect that this common, reggae-fied feature of global rap has a lot to do with the fact that the dancehall-infused hip-hop of the late 80s and early 90s - a moment of major crossover between rap and reggae - was some of the first, and most influential, hip-hop to really take root in ("underground") scenes abroad. so i've been taking note of that double/triple/quadruple-time, "flip-tongue" stylee for a while now, hearing it as one of the more audible examples of reggae's penetration into hip-hop's very vocabulary. and it turns up in the darnedest of places. back in '92, by reducing raggamuffin fastchat to riggity-riggity filigree, das efx suddenly made an exceedingly virtuosic technique accessible to the most mundane miggity-miggity macks. (prior to that, it was strictly for record-setting tongue-twisters like daddy freddy, the guinness-crowned "world's fastest rapper" at 507 syllables-per-minute!!) before long, even west coasters - fairly far from new york's caribbean critical mass - were telling folks to "chiggity-check" themselves (though, yeah, that was ice cube via das efx), and dr.dre was being called the "diggy diggy doctor" (via the quasi-ragga stylings of the DOC). incidentally, this is around the same time that raperos in PR were fastening on to dancehall's double-time flows. live performances by, say, baby rasta and gringo (see the noise biografia) featured moments where the latter would grab the mic and go "manamanamanamana- manamanamanamanamanamanamanamana..." until the crowd went wild. 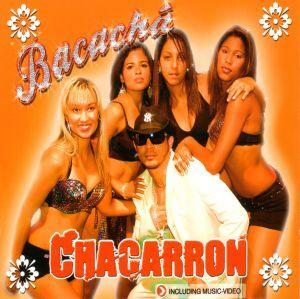 so it's no surprise that the ol' riggity trope turns up in a parody of reggaeton such as "chacarron." finally, in a strange twist of all this, i sent the link to the video above to dr.893, since i figured he'd appreciate it, burneminemineminem fan that he is. well, he went ahead and made this thing, yet another loop for a viral video (or two?!). I love that you have officialy created the first internet phenomenon based on in-depth analysis of an existing internet phenomenon. From now on my blog shall be exclusivly dedicated to covering your coverage of all things chacarron. Perhaps we convice someone to cover my coverage in turn and the cycle can repeat itself ad infinitum until the internet somehow eats itself. I feel good about this Wayne ,this is going to be bigger than Google. i'm not sure that "this" constitutes a phenomenon either, but i think "chacarron" may indeed deserve such status, especially considering the ymntd and youtube spinoffs. it gives zidane's headbutt a run for the money.